For all the ways we rely on electricity, we also invite the risk of fire into our home through its everyday use. In no particular order, here are five of the most common causes of electrical fires in our homes. Are you making any of these mistakes with your lights, laptops and chargers? Improper installation and the use of recalled components mean that consumer units have become a common culprit in domestic fires. What’s more, they are often fitted underneath the stairs, which can compromise an emergency exit. A change to Wiring Regulations means that all new installations must feature metal cladding for greater protection, and the London Fire Brigade have insisted that fuse boxes should be made from non-combustible materials. Lithium batteries provide the energy needed to fire up your laptop while taking up less space. But this highly reactive chemical has been known to explode when coming into contact with air – a risk you take when continuing to use a damaged battery. Batteries used in laptops can deteriorate when charged excessively and then left plugged in, so it’s wise to unplug your laptop once the battery is full. Modern houses are built with our need for multiple outlets in mind. With phone charging, lamps, TVs, fairy lights, routers and speaker docks all jostling for power, and limited capacity in older properties, increasing the number of outlets with adapters is the norm in most households.But overloading sockets can be very dangerous and if you must use more than the two available make sure you do so with caution. Never “daisy chain” extension leads, and check outlets and wires for blackness, smoke and damage before a fire has the chance to break out. Ever tried to change a halogen spotlight after it’s just gone? This is never recommended as these spotlights which are a popular feature in bathrooms and kitchens can reach 200°C. Apart from scorching your fingers they can easily ignite any combustible material that surrounds them, which is why it’s so important to make sure it’s clear of any such material, and has enough ventilation to allow heat to escape. Consider the use of spotlights in built-in bookshelves, for example. Are these spotlights given enough space behind closed doors, and plenty of room so they’re not too close to any books?LED bulbs, while more expensive, are a much safer bet as they’re heat free and also use less energy. Phone chargers are like buses – you can’t find any then suddenly you find yourself with a draw full, none of which fit your device. 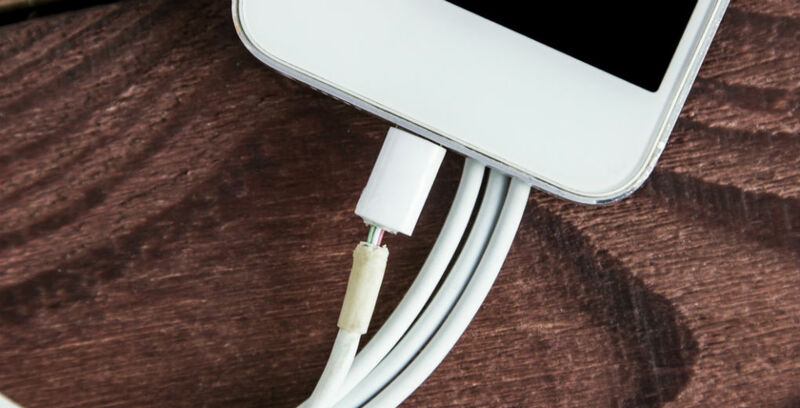 Cheap phone chargers which don’t come with your phone may be tempting, but they could provide a higher voltage than your device is designed to handle, presenting a risk of damage to your phone at best and a serious fire in the worst case scenario. There’s a reason the replacement chargers made by the manufactures cost more. These products will more likely comply with safety regulations and are worth the extra money when the alternative could be fires, electric shocks and injury. Unplug your phone once it’s fully charged and only use a charger that comes with your phone or is certified.